In this edition of our Director's Notes, GEWC accompanist and Ensemble director Mac Willaert shares some thoughts on one of his favorite pieces in our upcoming concert Celebrate! A Tapestry of American Music. Enjoy reading, and then click on this website to order your tickets for May 10 or 11! As I sit at my desk on a sunny April day, the breeze gently coming in through the window and birds chirping in the trees, I can't help but be thankful – spring has finally sprung! One can never take that for granted with Illinois weather, and it may disappear once or twice more before arriving on a more permanent basis, but this is a very literal breath of fresh air, and it has me feeling ready for all that spring brings. This, of course, includes our upcoming spring program, Celebrate! 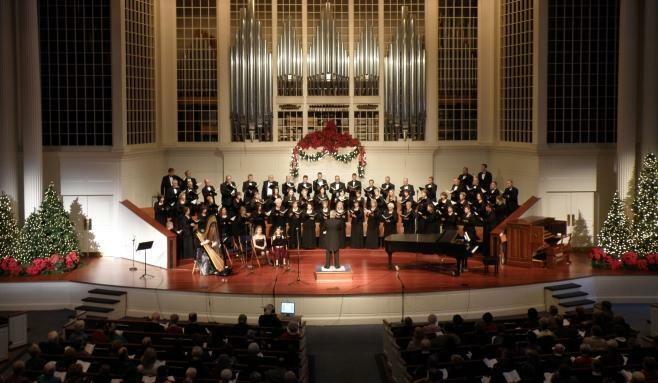 A Tapestry of American Music, which will cover myriad genres and periods of the American choral tradition. Topically, one of the songs I am most fond of from the upcoming program is a piece the Ensemble will be singing, a setting of the famed poet E.E. Cummings' "i thank You God for most this amazing." For those unfamiliar, Cummings was an esteemed American poet with an unorthodox use of grammar and sentence structure, hence the seemingly strange title of the poem. He was prone to using a lower-case "i" to address himself as a show of humility, while giving proper noun capitalization to other words and subjects he wished to emphasize or show deference towards, such as in this instance, "You God." Cummings goes on throughout the piece to express (in his own avant-garde fashion) a gratitude and thankfulness for God's creation; "the leaping greenly spirits of trees, and a blue true dream of sky," "live and love and wings," "everything which is natural, which is infinite, which is yes." There have been countless settings of this text for choral work, but the version I am perhaps most fond of was written by American composer and singer Elliot Z. Levine. In the span of one piece of music, he captures the playfulness and whimsy of nature alongside the marvel of being part of something greater than yourself. The music paints the picture in a way that complements the text tremendously, and it never fails to put me in a good mood. If it is possible for a song to sound like spring, Levine has nailed it. It is perhaps the trickiest piece for the Ensemble to tackle in this program, but we are diligently at work and are so looking forward to bringing it to our audiences in May. I like to picture Cummings writing this poem on a day much like today, where you can't help but pause and appreciate the beauty around us. No matter your faith, your background, or your beliefs, we have all experienced that wonderful sensation of a most amazing day, and with any luck, May 10th and 11th will be just that. See you then! Friday, May 10 at 7:30 p.m. and Saturday, May 11 at 3:00 p.m. Tired of the Winter Weather? Now let's be honest. Most of us, with few exceptions, actually choose to live here in the Midwest. So I guess we're without excuse. But knowing that doesn't make this winter weather much easier to bear. Snow, ice, extreme cold. We've had it all these past several weeks. And I'm ready for spring! How about you? Let's go ahead and assume that spring will be here by the weekend of May 10 and 11. (I know. You can never be too certain in Chicago.) That's the weekend that the Glen Ellyn-Wheaton Chorale presents our spring concerts Celebrate! A Tapestry of American Music. Ah, think of it! We could be enjoying temperatures in the 60s by then . . . or maybe even warmer! Maybe we should just pause right now and think on that a few minutes. Take the famous road that stretches from Chicago to Los Angeles! And many more! We'll be enjoying the warmth before you know it! Take a minute now, mark your calendar, and stay tuned to this website for more information about tickets! One of the thrills of being the guy who gets to stand in front of the Glen Ellyn-Wheaton Chorale is hearing a piece of music come to life. Weeks of rehearsal pay off as a piece that was once brand new becomes an old friend. There is another moment of joy when we get together for the first time with our orchestral friends. This fine group of players raises everything to a new level. What was already a beautiful piece of music now shimmers with the added sounds of musicians—strings, percussion, organ—all of whom are highly skilled in what they do. Let me share just one of those moments with you. My friend and colleague Howard Whitaker lends his saxophone artistry for two pieces in our upcoming Christmas concerts. One of those pieces is Dan Forrest's memorable setting of O Little Town of Bethlehem. I'm fairly certain that you've never heard this familiar carol set quite this way! Forrest's imaginative harmonies are brought to life by the Chorale, Mac Willaert's piano accompaniment, the strings, and Howard Whitaker with a very soulful soprano saxophone. I hope you'll take a moment and listen to the Glen Ellyn-Wheaton Chorale, along with piano, strings, and saxophone, as we sing this wonderful music. Then, may I invite you to get your tickets now for Wintersong 2018? There's lots more where this came from! It's the Most... BEAUTIFUL Time of the Year! even that is bounty enough. to bathe in it, to become part of it. This may seem at first like a strange quote with which to begin a blog about Christmas music! But as I sit thinking about some of the beautiful music being prepared by the Glen Ellyn-Wheaton Chorale for Wintersong, I think it may be rather relevant after all. Christmas has long been my favorite season of the year. One of the reasons for this, I think, is the great beauty it brings. Think of it—what could be more beautiful than God stooping to become one of us? Here is a Love that is beyond understanding—a Love that has moved artists and musicians through the years to create some of the most beautiful works imaginable. From Handel's Messiah to Bach's Magnificat, artists have found in the Incarnation inspiration to create works that literally soar to the heights. As the Chorale prepares for our Wintersong 2018 concerts, we're anticipating sharing the joy of this music with you! In this post I'd like to share just two of the pieces on our concert that have made it to the top of my "Beautiful Music" list. First, there is Ecce Novum, by Ola Gjeilo. The framework for this piece is really quite simple: it moves through several keys, but the harmonies remain basic. And so, it is a bit difficult to describe just why this piece is so moving. 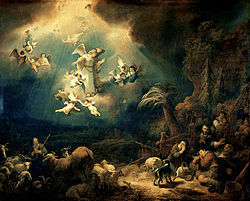 The Latin text paints the picture of Jesus' birth, and perhaps it is the simplicity of the music matching the bare simplicity of a birth in a manger that moves us. Gjeilo has given the piano the role of a straightforward accompaniment, and the strings whispering above it are marvelous. And then, what I think is one of the most beautiful features of this piece, a refrain that recurs throughout, consisting of a single, beautiful word: Alleluia. This Alleluia is first sung quietly, but gains intensity, and in the final moments of the piece, is sung with rapturous joy! I am looking forward to sharing this beauty with you! And these are just two of many more pieces that I think you will find bring you great joy this Christmas season. In addition to the full Chorale, Wintersong 2018 features the Ensemble, directed by Mac Willaert (who also serves as the Chorale's accompanist), the College Church pipe organ played by Daniel Mattix, and our wonderful string ensemble. In addition, saxophonist Howard Whitaker will join the Chorale for two selections. I certainly hope you'll put the dates on your calendar and order your tickets by visiting our Tickets page. I think you'll find Wintersong to be a wonderful way to begin your Christmas season! Friday, November 30 at 7:30 p.m. and Saturday, December 1 at 3:00 p.m. Behold a New Joy! Behold a New Wonder! O Little Town of Bethlehem is set by Dan Forrest (recall Dan's wonderful See Amid the Winter's Snow sung by the Chorale in a recent Wintersong concert). O Little Town of Bethlehem features the choir, piano, strings, and—of all things—a soprano saxophone! Rejoice and Sing! by John Rutter. You'll need to be able to count to seven for this one! That's right—it's I Saw Three Ships in 7/8 time! Sussex Carol in a setting by Elaine Hagenberg. Elaine is a young composer who is writing some absolutely beautiful music! We'll also sing her setting of All Praise to Thee, with text from Martin Luther. O Come All Ye Faithful. But wait a minute! Not exactly as you may be thinking of it! This is a rollicking setting by Jacob Narverud of the Pentatonix version of this favorite Christmas music. Sound like Christmas? It does to me! It's not too early to get one of our concerts on your calendar! We'll present two concerts, each featuring the Chorale, the Ensemble under the direction of Mac Willaert, the pipe organ, and strings. And as always, you'll be singing along too in several carols of Christmas. So . . . mark your calendar for Friday, November 30 at 7:30 p.m. or Saturday, December 1 at 3:00 p.m. Our concerts, as always, are at College Church, corner of Washington and Seminary in Wheaton. Watch this website for ticket availability and other information pertaining to the Chorale. We hope to see you in our audience this Christmas! LOVE IS IN THE AIR... and There's Lots of Music! They say a picture is worth a thousand words, and I think the photo you see here says it all! 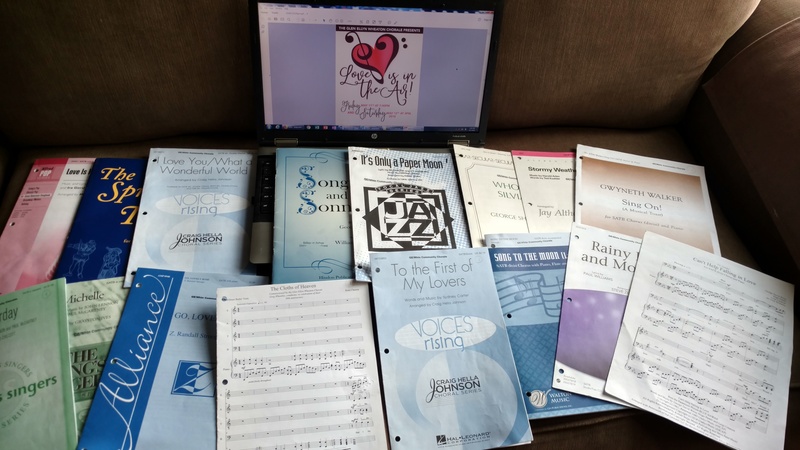 For the singers in the Glen Ellyn-Wheaton Chorale, and for us who are directors, accompanists, and instrumentalists, this stack of music represents the many hours of rehearsal that have gone into preparing for our spring concert LOVE IS IN THE AIR. And yes . . . every piece you see in this picture will be heard in our concert—and actually a few more not pictured here that will be sung by our smaller Ensemble. Starting at the top left of the photo, it's George Gershwin's classic Love Is Here to Stay. Vintage 1930s jazz in a nice arrangement by Mark Hayes. That blue cover that's hiding just to the right of the Gershwin piece is a beautiful setting of the W.B. Yeats poem Down by the Sally Gardens. It's for the men of the Chorale, accompanied by piano and clarinet. And speaking of the poetry of Yeats . . . bottom center is René Clausen's The Cloths of Heaven, commissioned and debuted by the GEWC two years ago. Two pieces by Z. Randall Stroope represent some of the most beautiful choral writing in this concert. Song to the Moon is a setting for choir, piano, flute, and oboe. 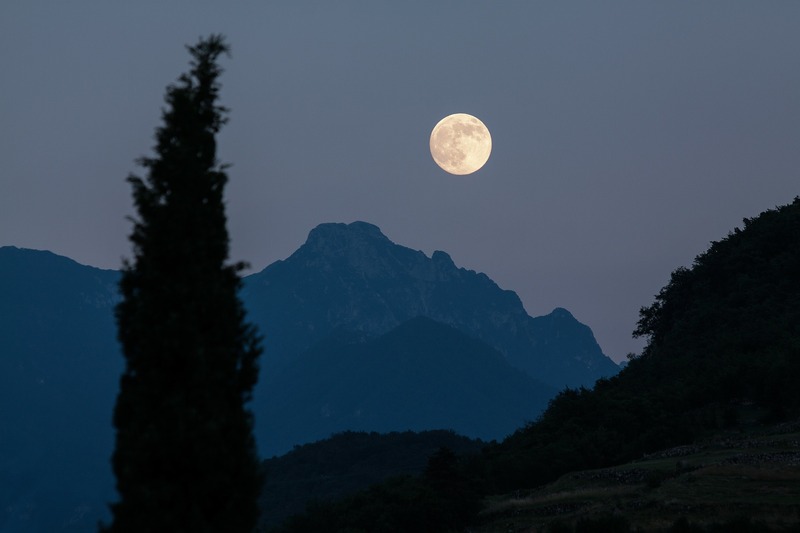 It evokes images of a lonely man or woman, asking the moon to go and tell their beloved of their true feelings. Go Lovely Rose sets the Edmund Waller poem that also seems to be speaking to an inanimate object—this time a rose—but is really aimed at the beloved. Moving a bit to the popular side of the program, you'll find titles such as Rainy Days and Mondays, the Beatles' classics Michelle, Yesterday, and Can't Buy Me Love (sung by the Ensemble). If you remember Elvis Presley crooning Can't Help Falling in Love, I think you'll enjoy the Chorale's rendition of that early 1960s hit. And as they say . . . "Wait! There's more!" But you'll have to hear it for yourself! Why not join us for an enjoyable afternoon or evening of love songs? Two concerts to choose from: Friday, May 11 at 7:30 p.m., or Saturday, May 12 at 3:00 p.m. Both concerts are at College Church in Wheaton (corner of Washington and Seminary). Tickets are available online. Just look for the info on this page and click on the banner. We'd love to have you in our audience! What is it about the moon? This mysterious light in our night sky has fascinated us as long ago as history has been recorded. It's been the object of everything from poetry to scientific exploration. Sometimes we like to attribute human characteristics to the moon. Remember this little verse from your childhood? Before you wonder what this blog is all about . . . no, the Glen Ellyn-Wheaton Chorale hasn't turned into an astronomy club! And yes . . . we're still rehearsing a concert of love songs—LOVE IS IN THE AIR. But I do want to tell you about one of those love songs, and it has a lot to do with the moon. Tell, O tell me, where my love lies. O moon, e'er you pass, wake my dreaming lover. I am waiting, I am calling. Tell him come. Tell him, O moon. Moon, help him. Help him remember and dream of me. Tell him, O tell him who is waiting, who is longing! The setting of this poem is Stroope at his finest. To the choir and piano, he has added the longing sounds of flute and oboe. He adds to this the recurring phrase la luna, set to musical intervals that cause the listener to feel the sadness of a missing love. Without doubt, Song to the Moon is one of the more challenging pieces to prepare. But the challenge is one that pays off in an evocative setting of a beautiful text. We think you'll agree! Song to the Moon is just one of many selections you'll be treated to when you attend one of the Chorale's LOVE IS IN THE AIR concerts. And there's some lighter fare as well! Songs like Rainy Days and Mondays, Love Is Here to Stay, and others. This is "the week that was." Football players have their "two-a-day" workouts, and the Chorale has its "two-a-week" rehearsals. Our normal rehearsal schedule has us together for two hours once a week—Tuesday nights. But for two weeks just prior to our concerts, we meet on two consecutive evenings—two hours each night. It's fatiguing, let's be honest. But the exhaustion gives way to the joy we feel in anticipating two wonderful concerts at the end of the week. 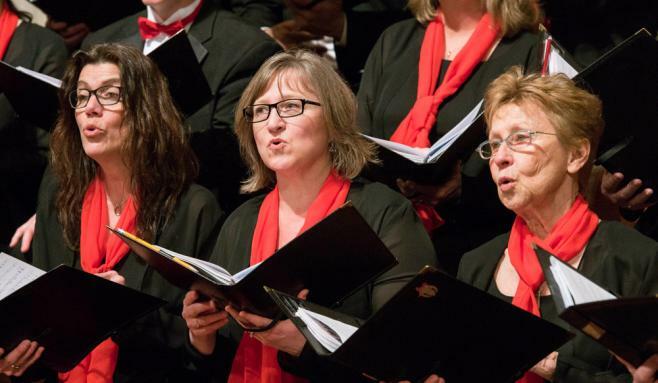 There's nothing quite like the thrill of hearing beautiful music come together, the many voice parts finding their way into the grand mix that is choral music. Add to that the beauty of the Christmas texts and tunes, and well.....it's something I look forward to every year. If you've been following this blog, you know that Mac Willaert and I have been giving you a sneak peek into some of the things you'll be hearing in Wintersong 2017: Christmas with the Glen Ellyn-Wheaton Chorale. In this final post before our concerts, I thought I'd take a step back and give you a bit of an overview of our concert. I'm going to try to do that without "giving away the store." After all, we DO want you to experience the concert for yourself this weekend! That picture you're seeing is the beautiful sanctuary of College Church in Wheaton. It's been our singing home for something like 13 years now, and we love it! You will too! As you can see in the picture from a previous Christmas, you'll find the sanctuary decked out in Christmas colors, waiting for the sounds of the choir to fill it. And those majestic pipes in the front? Yes, those are real! And you'll hear them the very first thing as the Chorale sings Mack Wilberg's rousing setting of Hark! The Herald Angels Sing. Immediately after the last chord subsides, the organ crescendos again, and you are invited to join us in singing Joy to the World. That will be the first of more opportunities for you to sing favorite songs of Christmas with the Chorale. The first half of our concert includes a rollicking arrangement of Here We Come A Caroling, a poignant setting of See Amid the Winter's Snow, and the ensemble singing Ruth Morris Gray's No Room No Room. Just before intermission, you'll be tapping your toe to Shawn Kirchner's Brightest and Best, which features Kristen LeJeune on fiddle. Yes, I said fiddle! And wow! You just have to hear it! After a brief intermission, it's two lively settings of two familiar carols: God Rest Ye and Deck the Hall. Mac Willaert and the ensemble return to sing Ola Gjeilo's haunting Spotless Rose. Then it's time for you to sing again, with a medley of familiar carols. Eric Whitacre's Glow (originally written for Walt Disney World), Ding Dong! Merrily on High, and Fum Fum Fum lead into a fun-filled arrangement of Gloucestershire Wassail, complete with organ and percussion, with the Chorale wassailing you in surround sound! What better way to welcome in the season of Advent and Christmas! We'd be honored to have you join us! Remember—there are two performances: Friday, December 1 at 7:30, and Saturday, December 2 at 3:00. Tickets are available through Thursday night by clicking on the ticket banner on this page. After that, they are available at the door for both Friday and Saturday concerts. And please check out our newly lowered student ticket prices! It's now more affordable to pack up those kids and bring them with you! I hope to see you at Wintersong 2017: Christmas with the Glen Ellyn-Wheaton Chorale! And with your news the world endow. Sing peace, sing gift of peace! I'm a bit of a news junkie—I admit it. I watch more than my weekly minimum daily requirement. What that may mean for my being an informed citizen is probably compensated for (in a not so good way) by viewing too much that is troubling. From the political wrangling that seems to dominate our national conversation, to acts of violence that can only be described as evil, the world sometimes seems to be spinning out of control. It's against that backdrop that Jaroslav Vayda's poem becomes all the more poignant. Look at those last two lines: Sing peace, sing peace, sing gift of peace, Sing peace, sing gift of peace! He isn't content to simply ask us to "Sing peace." He insistently repeats the line five times! And along the way, listen to how those words unfold, with their softly sibilant ess sounds. The very sounds themselves seem to be a whisper of peace. I dare say that in everyday speech, you rarely use any of these words! And that's the point, isn't it? These words are reserved for this moment, to help us ponder the amazing things we are witnessing: the things that make up the marvel of this night! All of this wonder in the text is matched by the beautiful musical setting of composer Carl Schalk. Always calm (delaying anything louder than mezzo forte until the very end), Schalk's melody rises and falls with a contour that wonderfully complements the text. The music joins the text as we're invited in to this wide-eyed wonder at what God has done on this marvelous night in Bethlehem. In royal splendor come arrayed. Sing bliss, sing endless bliss! There it is (see the bolded text)! Don't we weary people need a glimpse of heavenly bliss? Even the smallest "teasing taste" of this glory of God would be enough to make us want nothing but that! Here is a performance of Before the Marvel of This Night by the GEWC from our 2012 Christmas concert. For more information on WINTERSONG 2017: Christmas with the Glen Ellyn-Wheaton Chorale, and to order tickets, click on the link on this page. How Many Halls Are We Decking?